Unlike existing observation hives that are limited by their fixed size, BEEcosystem’s modularity offers the ability to expand the interior hive space by attaching additional wall-mounted HexHive bodies. If you’re a beekeeper, you know that Langstroth and Warre hives have always expanded vertically by adding new boxes and supers—now, BEEcosystem is the first observation hive to use the same tried and true logic, but over a vertical plane, expanding across your wall in a hexagonal honeycomb-styled design. BEEcosystem's modular expansion works by using our unique vent-to-passageway connection points. Because both the hive’s side vents and additional HexHive bodies attach at the same point, by simply sliding out any one of the four side-ventilation screens, another HexHive body can be attached to create a more spacious hive interior—giving your observation colony room it needs to grow and thrive. All HexHives include a transfer tube and simple window connection unit for the option of noninvasive indoor observation hive setups, so your bees will be able to come and go freely from their outdoor foraging flights in search of floral pollen and nectar. No matter how many HexHives you choose to start with, you’ll enjoy the same unparalleled viewing access into the intricate lives of your social bees. BEEcosystem was designed to mount and expand along your indoor or outdoor wall. Each BEEcosystem hive measures nearly ~22" in length by ~19" in height by ~5" in depth (measured outward from the wall) - more exact dimensions in diagram to the right. The weight of each hive is 12 pounds without comb and bees. Adding the bees and honeycomb increases hive weight to roughly 25-35 pounds in total. We include a sturdy bracket for mounting each HexHive into a secure wall stud or vertical/structural member - BEEcosystem hive and frame dimensions are designed specifically so that each sequential HexHive can wall-mount at the US standard 16"-on-center stud spacing. Besides modularity, there are some additional key features that differentiate BEEcosystem from other observation hives. If you plan to setup your BEEcosystem hive indoors, we understand if you may have concerns about failsafes—that's why we include spring-loaded safety closure hinges. No other existing observation hive to our knowledge employs this type of simple auto-closure mechanism. With our integrated safety closure hinges, should the transfer tube ever become disconnected at either end—at the HexHive body or at the window unit—the spring-loaded hinges automatically seal off the honeybees to remain safely inside the hive body and/or outside the window unit until the tube disconnection can be corrected. Other indoor observation hives on the market require the beekeeper to drill a hole from the inside to the outside their exterior wall, just to accommodate the simple transfer tube that bees move through to come and go from indoors to outdoors. When almost every exterior wall now seems to have sliding windows, we thought this was a silly standard requirement for any first indoor observation hive setup. Instead, BEEcosystem customers receive our simple, noninvasive transfer tube solution—allowing anyone to house their hive inside without having to damage property by drilling a large hole in an exterior wall. 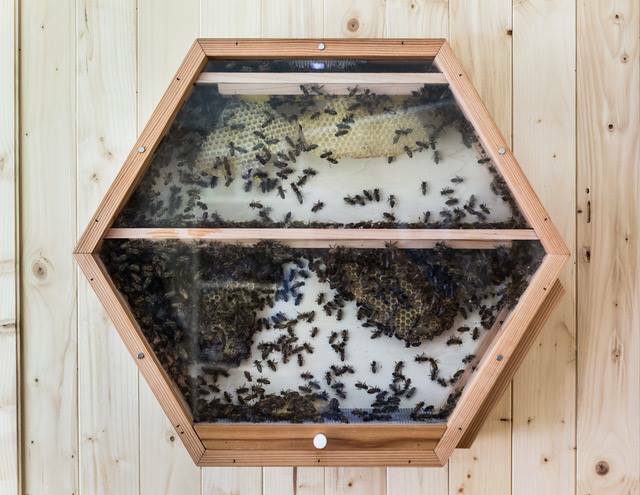 Try out the indoor hive without making any permanent modifications - if you later decide to move it outdoors, or to make a wall modification to install it indoors more permanently, you are able to do so normally. Our simple window unit is comprised of a durable insulating foam block, which can be cut-to-length to fit snuggly into any sliding window, whether double-hung or horizontally sliding. A pre-cut circular hole in the window unit fits tightly around the transfer tube's entrance/exit hole, allowing the bees to come and go as they please right through your sealed window, and sparing your exterior walls from invasive modifications. An outdoor-facing landing platform is also included, which clamps securely around the window unit to sit outside right below the entrance/exit end of the transfer tube, giving your honeybees a convenient perch for takeoff and landing. When we began working on BEEcosystem in October of 2014, our goal was to design the most user-friendly observation beehive ever. Here’s how we did it. A PRACTICAL CLEANING DRAWER: We included a cleaning drawer right below the screened-off "bottom board"—indoors or outdoors, simply open up the bottom drawer to wipe out any discarded beeswax caps or fallen debris, while your bees remain safely inside the hive above the "bottom board" screen. The cleaning drawer can additionally be used in conjunction with other commercial honeybee pest treatments or hygienic and testing products, which can be applied to the inside surface of the drawer to detect or trap pests like mites, wax months, or hive beetles below the bottom board. Many other products can also be applied to the hive via simply sliding the side-vent screens. A SIMPLIFIED, HIVE-TOP FEEDER: We designed a hive-top feeder that uses standard mason jars. During the beginning of the spring beekeeping season, as well as at other times when few flowers are in bloom and the natural nectar flow is low, sucrose solutions (regular table sugar + water) are commonly used to provide honeybees with extra calories. While sucrose is not particularly nutritious, bees certainly need the extra calories from time to time—for example, in the highly energy-intensive process of building new beeswax. Mason jars not only look simple and elegant, but are readily available everywhere, and easy to use when preparing a sugar feeder jar. Other honeybee dietary supplements, like pollen, protein-rich substitutes or fondant can sometimes be fed through the hive-top feeder screen, but also be fed by simply sliding the side-vent screens. When not being used for feeding, the hive-top screen acts as an extra circular top vent, covered for weather protection on outdoor hives. A PHYSIO-LOGICAL NIGHTTIME COVER: We redesigned the observation hive viewing cover using a plexiglass that filters through only red colored light. Just like us, honeybees use sunlight to regulate their natural day-night cycles in a “circadian rhythm.” This means that nighttime artificial (human) lighting, whether indoor or outdoor, has the potential to confuse bees about what time of day it is. Other existing observation hives will suggest piling blankets over the hive viewing window at night, or offer bulky quilt cover add-ons. Because honeybees' color vision is shifted toward the violet side of the visible light spectrum, bees can actually see some colors of natural light that we call "ultraviolet"—but bees also don't see as much red light as the human eye, maxing out at a ~600nm visible electromagnetic wavelength (versus the human eye's 700nm perceivable red maximum). We used honeybees’ visual physiology to design a semi-transparent red light-filtering plexiglass nighttime viewing cover, which simply slides on and off via the 2 top pins, overtop of the regular daytime clear plexiglass viewing window of the regular daytime clear plexiglass viewing window. So after dark, cover up your hive viewing window—you'll still see your honeybees (tinted red), but they won't see you. We incorporated 6 specially sized "foundationless" top bar style frames into each HexHive body. We wanted BEEcosystem to resemble as natural a beehive as possible within a vertical plane, and wanted the hive to show the processes of honeybees building up their colony and new comb—that's why we chose to eliminate all plasti-cell and frame foundations, ensuring that the view of the colony is never obstructed, and also making it possible to harvest raw cut comb honey outdoors. Our foundationless top-bar style frames resemble those used in typical Warre and Top Bar hives, and allow the bees to naturally build their comb downward from the suspended wedge-angled bars.